Changes in surface height as measured by satellite altimeters suggest the Antarctic peninsula is experiencing a net gain of ice cover. The analysis suggests Antarctic ice sheet showed a net gain of 112 billion tons of ice a year from 1992 to 2001. However, this net gain slowed to 82 billion tons of ice per year between 2003 and 2008. Some parts the peninsula experienced substantial ice cover gain (East Antarctica), while other parts showed evidence of ice discharge (West Antarctica). The NASA researchers involved in the new study explain that this elevation gain is not the result of a recent event, but rather the continuation of a process that began 10,000 years ago at the end of the last Ice Age. Since then, the air became warmer and moisture increased, doubling the amount of snow precipitated on the Antarctic ice sheet. Over time, the snow compacted into solid ice, steadily accumulating. In East Antarctica and the interior of West Antarctica this process increased the ice cover height by an average of 0.7 inches (1.7 centimeters) per year. 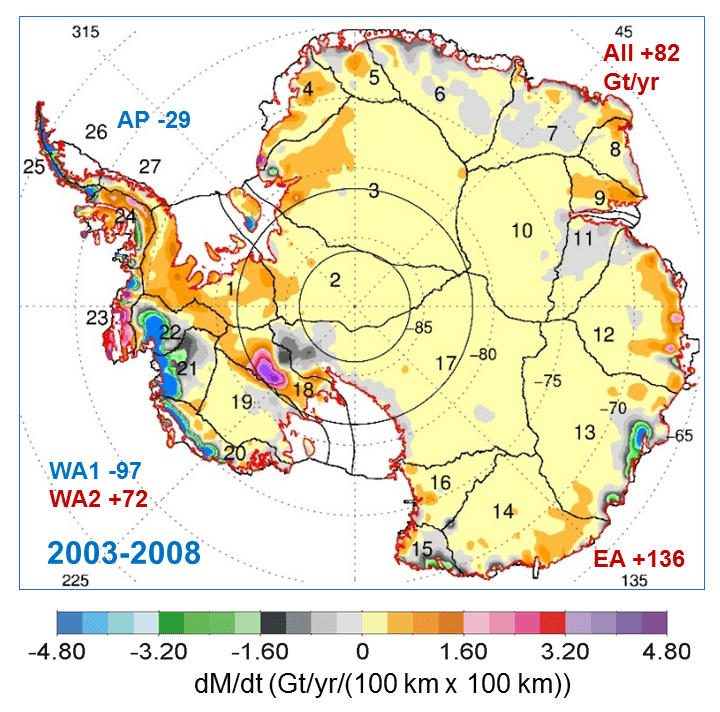 Map showing the rates of mass changes from ICESat 2003-2008 over Antarctica. Sums are for all of Antarctica: East Antarctica (EA, 2-17); interior West Antarctica (WA2, 1, 18, 19, and 23); coastal West Antarctica (WA1, 20-21); and the Antarctic Peninsula (24-27). A gigaton (Gt) corresponds to a billion metric tons, or 1.1 billion U.S. tons. Zwally’s team calculated that the mass gain from the thickening of East Antarctica remained steady from 1992 to 2008 at 200 billion tons per year, while the ice losses from the coastal regions of West Antarctica and the Antarctic Peninsula increased by 65 billion tons per year. These findings contradict the 2013 report issued by the Intergovernmental Panel on Climate Change which suggested 147 billion tonnes of Antarctic sheet ice were lost per year between 2002 and 2011. These findings are definitely surprising. They suggest that the Antarctic peninsula isn’t in such a critical state as previously reported by other studies. At the same time, these results should be taken with caution. Measuring subtle differences in ice elevation across the Antarctic using satellites hundreds of miles above it can be prone to anomalies. Hence, the accuracy of these findings are put in doubt. For instance, a study made by researchers at the Australian National University in Canberra studied Antarctic ice melting in a historical context by drilling ice core samples. Their work suggests Antarctic ice is melting 10 times faster than 1,000 years ago. 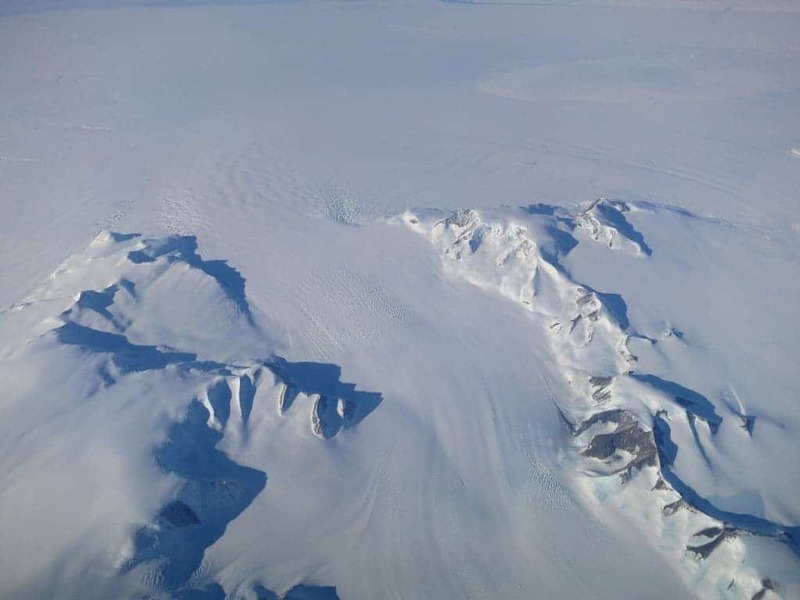 Moreover, based on this altimetry study alone, the researchers claim that if the West Antarctic ice sheet continues to dwindle at its current rate, the peninsula will experience a net loss of ice in just a couple of decades.